“There is nothing like a disaster to boost an aid agency’s profile.” It’s a truism evidenced by every humanitarian crisis in recent history, from the Sudanese famine captured by Kevin Carter’s iconic photograph as described in The Bang Bang Club, to the crisis now gripping West Africa. What the UN and the media had struggled to do until Carter happened upon the scene of a dying child was show the incontrovertible evidence of a human tragedy – the international community could no longer avert its gaze. Carter went on to win the Pulitzer Prize but as with the people on whom the camera lens momentarily shines, and millions on whom it never does, the child’s fate remains unknown. 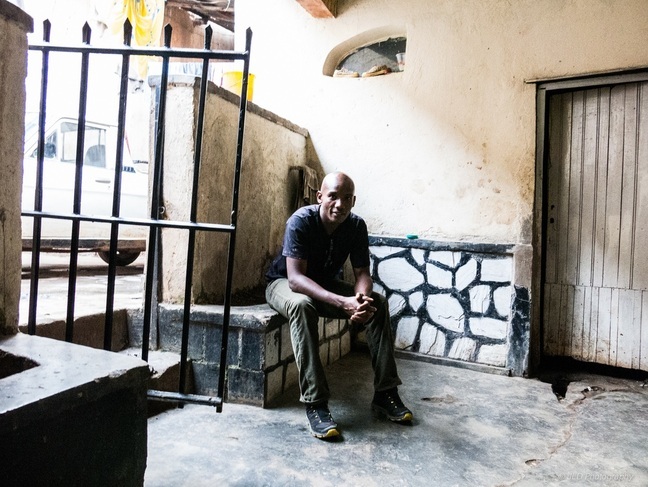 “The media can be as powerful as a weapon,” says Jean Luc Dushime, a survivor of the Rwandan genocide and a photojournalist whose experiences of how the Western world “participated in the crisis” has moved him to seek alternative ways to use photography to advocate for change. In 1994, at the height of the conflict that claimed 800,000 lives, Dushime and his family walked for miles through the Rwandan jungle to find refuge in the Democratic Republic of Congo. Their only access to the outside world was Voice of America, whose reports they heard on mobile radios. “The media were telling people not to go to areas that were under siege. Because of that, thousands of people who were trying to get out stopped trying and were trapped,” he recalls. “Most of the time the Western media is trying to tackle the symptoms instead of the real causes of the disease. I have been a refugee so I know that when aid organisations give food it ends up in the market and is used by warlords and to buy other things; that all perpetrates wars. Today, 15 million people across the Sahel including in Niger, Mauritania, Mali, Chad and Senegal are facing food shortages that the humanitarian community warns could result in a crisis akin to that which began in the Horn of Africa last year. As with Sudan, the early warning signs from both regions came long before the tipping point. Christian Aid has been working with communities in the Sahel for the past three years to build their resilience against disaster. News and Campaigns Editor Andrew Hogg says it is “deeply frustrating” that people do not respond to calls for prevention, “but the reality is that the numbers have not been catastrophic and the crisis was not of sufficient magnitude until now to prompt a more significant response”. Dushime is not unsympathetic to what he feels is the self-perpetuating system that journalists and humanitarian campaigners have become entrenched in. But he challenges the claim that their mission is to protect people’s dignity. He believes the portrayal of Africa as a continent in perpetual need diminishes the resilience of Africans and causes the West to lose faith. Rather than enabling citizens to heal, images that reinforce the sense of desperation create a dependency on aid that is fuelled by the mainstream media and only sustains the organisations that Dushime describes as part of a “money-making machine”. The case for disaster risk reduction is a sticking point for the aid industry. According to Oxfam, Ethiopia lost an average of US$1.1bn to drought every year between 1997 and 2007, compared with the US$1.3bn provided each year by international aid over the same period. While in 2005 in Niger when the country’s children were facing malnutrition, CARE International said immediate intervention would have cost US$1 a day compared to the US$80 it ultimately cost to save one child’s life. Dushime plans to return to Africa to help people tell a more positive story that does not rely on the mainstream media.